There was light, love, laughter, and plenty of food. Presents for all. And the joy of being together. It is a wonderful Christmas. What did we do for entertainment before these two little charmers came along? 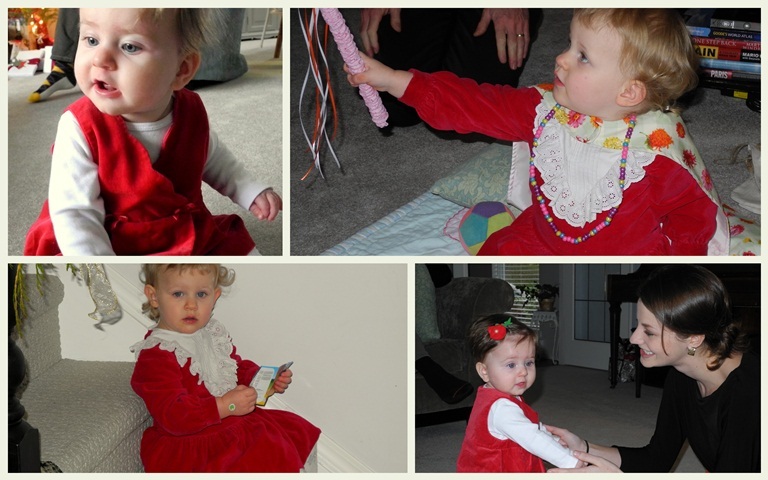 Little Miss S is sitting well these days, looking Christmassy in her red jumper. Little Miss A is wearing a dress made by her great-grandmother for her aunt a long while ago. One never knows which particular gift will strike a responsive chord. This year, Miss A took the instruction booklet that came with one of her toys and sat down on the stairs to read it. She read it out loud to herself, deciphering the pictures in her own imaginative way. So delightful. It's still Christmas around here. Fun times are planned for this week, including my family coming from the mainland for a midday dinner on the 29th. We will be 27 in number. I'm off to prepare some desserts! I hope your Christmas is continuing! I see that your little one is wearing a heritage dress, just as one of mine was this past week -- very special! We're also keeping Christmas going here, with one of our daughters arriving with family tomorrow for 3 or 4 days. They'll be heading out every day to visit my Son-in-law's family, so that we'll have the perfect mix of quiet and company each day. And yes, what did we do for entertainment before our little ones? yours look delightful! Sweet photos of the little ones! Happy Boxing Day! Oh what sweet little girls in such darling dresses! Can there be anything so delightful? I wish I had heard your little Miss A reading her instruction book. A bibliophile at her tender age, apparently. Such fun! Adorable photos and I love your lighted terrarium. Hosting 27?! *thud* Oh my, that will be fun! I hope that you'll include the menu and lots of photos. Donna! Were you working in the Blue Poppy? or the Gift Shop? Those were the two places we talked with people (that we can remember). It would have been fun to meet you. Love the Christmas dress with a story! Cute little charmers...for sure. How fun...to have your family heading to the island for a celebration meal this time. You will be busy. Enjoy! Beautiful pictures! The girls are soooooo adorable! I need to do an update on my blog. Excited for you that your Christmas is continuing. Our's is done.... ha! But it was grand! Hugs to you! We had a red jumper at our house too this Christmas. Must be the fashion for at least the younger ones. I remember the red jumper I wore in Kindergarten. Love jumpers! It looks like a wonderful time for you all! We are busy with family coming in for a few days into the new year. Good times! Wonderful. Children getting married with partners families to consider does change the whole dynamics of Christmas.